Rocket the raccoon from Guardians of the Galaxy, arguably one of the best comic movies made so far! Little baby Groot is removable from his little flowerpot! The pattern contains instructions for Rocket and his accessory gun/blaster thing, and his backpack. Also included in this pattern is the pattern for the tiny baby Groot! 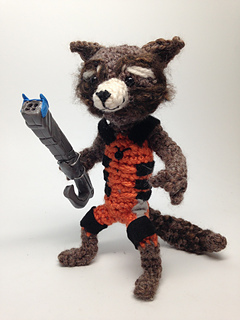 In Volume 2 of GOTG, Groot has moved out of his pot, and you can uproot your little crocheted Groot too. Pattern is 16 pages long and has lots and lots of photos and step by step instructions. Craftyiscool patterns may be used to make items for sale as long as credit is given to “Allison Hoffman, craftyiscool.com” in any listings as the original source. Lil Groot standing is 3.5” tall. Make sure you check out my other patterns for the full size Groot!